A Calderdale firm’s community grant scheme is helping fund a group of disabled riders to compete in July’s Special Olympic Games. The Leo Group, which is one of the country’s leading renewable companies, has given Haworth Riding for the Disabled in excess of £2,000, which will contribute to four riders participating in the equestrian event, which this year is being held at Hartpury College, Gloucester. The money donated by the Leo Group will go towards paying the entry fees, transport, accommodation, horse feed and providing support for the riders whilst at the Games. The four, Brian Bentley, Lucy Hargreaves, Benjamin Aston and Jenny Lee are part of a team of 18 representing the Yorkshire and Humberside region, and will be competing in the Countryside Challenge, Dressage and Horse Care and Knowledge categories. Last year the Leo Group handed more than £125,000 to charities and other good causes across the communities where it operates. These included Bradford and District Autistic Support Group, Manorlands Sue Ryder Hospice, at Oxenhope, Northowram Cricket Club and Action for Children. “Once again we were inundated with requests for support, and it is an incredibly difficult job choosing those good causes and charities to benefit from the fund. “For us, Haworth Riding for the Disabled ticked all the boxes. Not being able to send the riders to the Special Olympic Games due to a lack of money would have been heart breaking. “We are eternally grateful to the Leo Group for considering our community grant application. 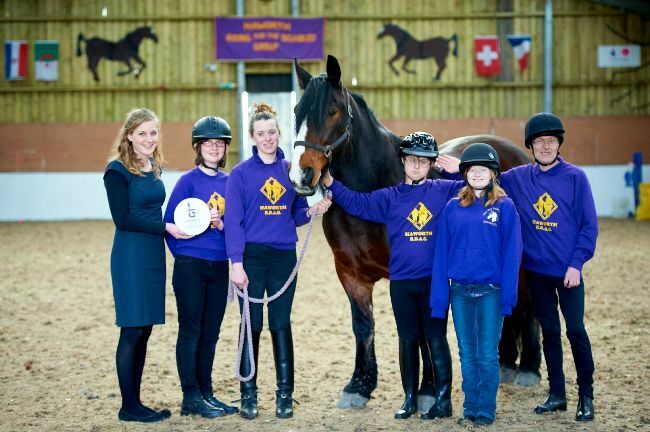 Haworth Riding for the Disabled was formed in 2001 with one rider, one pony and three volunteers. It now has ten horses, more than 60 volunteers and caters for around 150 riders, both adult and children. Leo Group is based in Swales Moor, Calderdale, and employs in excess of 400 people at locations across the country. The firm set up the Fund to offer financial assistance to local groups, particularly those involving young people and those in need. Leo Group’s Community Liaison Manager Catherine Horn (far left) with riders Brian Bentley, Benjamin Ashton, Jenny Lee and Lucy Hargreaves. Holding Chief, the horse, is Claire Coultas, who trains the four.